Originally set up to for research to extract the venom from snakes to make anti-venom, the Snake Farm is a great place to take the kids if they're interested in these slithering creatures. 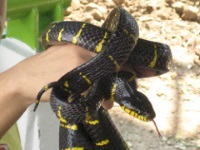 Featuring Malayan Pit Vipers, King Cobras, Banded Kraits and Russell Vipers, the Snake Farm educates the public on snakes and safety surrounding them. Venom-milking and snake-handling shows are held daily at 10:30am and 2pm on weekdays, and 10:30am on public holidays. Opening times: Monday to Friday 9.30am to 3.30pm, Saturday and Sunday 9.30am to 1pm. Admission: THB 200 for adults.